This article is about the plant, Spinacia oleracea. For other leaf vegetables, see Spinach (disambiguation). It is an annual plant (rarely biennial), growing as tall as 30 cm (1 ft). Spinach may overwinter in temperate regions. The leaves are alternate, simple, ovate to triangular, and very variable in size: 2–30 cm (1–12 in) long and 1–15 cm (0.4–5.9 in) broad, with larger leaves at the base of the plant and small leaves higher on the flowering stem. The flowers are inconspicuous, yellow-green, 3–4 mm (0.1–0.2 in) in diameter, and mature into a small, hard, dry, lumpy fruit cluster 5–10 mm (0.2–0.4 in) across containing several seeds. In 2016, world production of spinach was 26.7 million tonnes, with China alone accounting for 92% of the total. 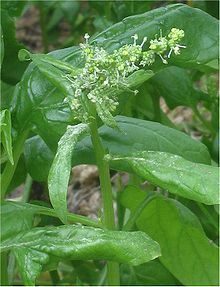 The English word "spinach" dates to the late 14th century from espinache (French, épinard) of uncertain origin. Common spinach, S. oleracea, was long considered to be in the family Chenopodiaceae, but in 2003 that family was merged into the Amaranthaceae in the order Caryophyllales. Within the family Amaranthaceae sensu lato, Spinach belongs to the subfamily Chenopodioideae. Spinach is an annual plant (rarely biennial) growing as tall as 30 cm (1 ft). Spinach may overwinter in temperate regions. The leaves are alternate, simple, ovate to triangular, and very variable in size: 2–30 cm (1–12 in) long and 1–15 cm (0.4–5.9 in) broad, with larger leaves at the base of the plant and small leaves higher on the flowering stem. The flowers are inconspicuous, yellow-green, 3–4 mm (0.1–0.2 in) in diameter, and mature into a small, hard, dry, lumpy fruit cluster 5–10 mm (0.2–0.4 in) across containing several seeds. Raw spinach is 91% water, 4% carbohydrates, 3% protein, and contains negligible fat (table). In a 100 g (3.5 oz) serving providing only 23 calories, spinach has a high nutritional value, especially when fresh, frozen, steamed, or quickly boiled. It is a rich source (20% or more of the Daily Value, DV) of vitamin A, vitamin C, vitamin K, magnesium, manganese, iron and folate (table). Spinach is a good source (10-19% of DV) of the B vitamins riboflavin and vitamin B6, vitamin E, calcium, potassium, and dietary fiber. Spinach, along with other green, leafy vegetables, contains an appreciable amount of iron attaining 21% of the Daily Value in a 100 g (3.5 oz) amount of raw spinach (table). For example, the United States Department of Agriculture states that a 100 g (3.5 oz) serving of cooked spinach contains 3.57 mg of iron, whereas a 100 g (3.5 oz) ground hamburger patty contains 2.49 mg. However, spinach contains iron absorption-inhibiting substances, including high levels of oxalate, which can bind to the iron to form ferrous oxalate and render much of the iron in spinach unusable by the body. In addition to preventing absorption and use, high levels of oxalates remove iron from the body. Spinach also has a moderate calcium content which can be affected by oxalates, decreasing its absorption. The calcium in spinach is among the least bioavailable of food calcium sources. By way of comparison, the human body can absorb about half of the calcium present in broccoli, yet only around 5% of the calcium in spinach. A quantity of 3.5 ounces of spinach contains over four times the recommended daily intake of vitamin K. For this reason, individuals taking the anticoagulant warfarin, which acts by inhibiting vitamin K, are instructed not to eat spinach (as well as other dark green leafy vegetables) to avoid blunting the effect of warfarin. Fresh spinach is sold loose, bunched, or packaged fresh in bags. Fresh spinach loses much of its nutritional value with storage of more than a few days. Fresh spinach is packaged in air, or in nitrogen gas to extend shelf life. While refrigeration slows this effect to about eight days, fresh spinach loses most of its folate and carotenoid content over this period of time. For longer storage, it is canned, or blanched or cooked and frozen. Frozen spinach can be stored for up to eight months. Some packaged spinach is exposed to radiation to kill any harmful bacteria. The Food and Drug Administration approves of irradiation of spinach leaves up to 4.0 kilograys; however, using radiation to sanitize spinach is of concern because it may deplete the leaves of their nutritional value. Researchers at the Agricultural Research Service experimentally tested the concentrations of vitamins C, E, K, B9, and four carotenoids in packaged spinach following irradiation. They found with increasing level of irradiation, four nutrients showed little or no change. Those nutrients include vitamins B9, E, K, and the carotenoid neoxanthin. This study showed the irradiation of packaged spinach to have little or no change to the nutritional value of the crop, and the health benefits of irradiating packed spinach to reduce harmful bacteria seem to outweigh the loss of nutrients. Spinach may be high in cadmium contamination depending on the soil and location where the spinach is grown,. The comics and cartoon character Popeye the Sailor Man has been portrayed since 1931 as having a strong affinity for spinach, particularly the canned variety. He becomes physically stronger after consuming it. Spinach is thought to have originated in ancient Persia (modern Iran and neighboring countries). The plant was subsequently introduced to ancient China, where it was known as "Persian vegetable" (bōsī cài; 波斯菜; present:菠菜). The earliest available record of the spinach plant was recorded in Chinese, stating it was introduced into China via Nepal (probably in 647 AD). In AD 827, the Saracens introduced spinach to Sicily. The first written evidence of spinach in the Mediterranean was recorded in three 10th-century works: the medical work by al-Rāzī (known as Rhazes in the West) and in two agricultural treatises, one by Ibn Waḥshīyah and the other by Qusṭus al-Rūmī. Spinach became a popular vegetable in the Arab Mediterranean and arrived in Spain by the latter part of the 12th century, where it was called raʼīs al-buqūl, 'the chieftain of leafy greens'. Spinach was also the subject of a special treatise in the 11th century by Ibn Ḥajjāj. The prickly-seeded form of spinach was known in Germany by no later than the 13th century, though the smooth-seeded form was not described until 1552. Spinach first appeared in England and France in the 14th century, probably via Spain, and it gained quick popularity because it appeared in early spring, when other vegetables were scarce and when Lenten dietary restrictions discouraged consumption of other foods. Spinach is mentioned in the first known English cookbook, the Forme of Cury (1390), where it is referred to as 'spinnedge' and/or 'spynoches'. Smooth-seeded spinach was described in 1552. During World War I, wine fortified with spinach juice, which contains large quantities of vitamin K, was given to French soldiers afflicted with hemorrhage in hopes of ameliorating their condition. ^ a b c "Crops/Regions/World List for Production Quantity of Spinach in 2016". UN Food & Agriculture Organization. 2017. Retrieved 16 August 2018. ^ "Spinach". Online Etymology Dictionary, Douglas Harper. 2019. Retrieved 6 March 2019. ^ a b "Raw spinach per 100 g, Full Report from the USDA National Nutrient Database". US Department of Agriculture, National Nutrient Database for Standard Reference Release 27. 2014. Retrieved 1 February 2015. ^ Williams, Sue Rodwell; Long, Sara (1997). Nutrition and diet therapy. p. 229. ISBN 978-0-8151-9273-2. ^ Insel, Paul M.; Turner, R. Elaine; Ross, Don (2003). Nutrition. p. 474. ISBN 978-0-7637-0765-1. Retrieved 2009-04-15. ^ Heaney, Robert Proulx (2006). Calcium in human health. p. 135. ISBN 978-1-59259-961-5. Retrieved 2009-04-15. ^ Sheps SG (19 April 2018). "Warfarin diet: What foods should I avoid?". Mayo Clinic. Retrieved 6 March 2019. ^ "Storage Time And Temperature Effects Nutrients In Spinach". Retrieved 2008-07-05. ^ a b Bliss RM (27 May 2010). "Nutrient Retention of Safer Salads Explored". US Department of Agriculture. ^ "ToxGuide for cadmium" (PDF). Atlanta, GA: Agency for Toxic Substances and Disease Registry, US Department of Health and Human Services. October 2012. ^ Gabbatt, Adam (8 December 2009). "E.C. Segar, Popeye's creator, celebrated with a Google doodle". The Guardian. Retrieved 5 May 2010. ^ a b c Boswell, Victor R. (August 1949). "Garden Peas and Spinach from the Middle East". Reprint of "Our Vegetable Travelers". National Geographic Magazine. 96 (2). Archived from the original on March 23, 2010. Retrieved March 7, 2010. ^ Rolland, Jacques L.; Sherman, Carol (2006). The Food Encyclopedia. Toronto: Robert Rose. pp. 335–338. ISBN 9780778801504. ^ Ibn al-ʻAwwām, Yaḥyá ibn Muḥammad. "23.8". Kitāb al-Filāḥah. Retrieved July 30, 2014. ^ Clifford A. Wright. Mediterranean Vegetables: A Cook's ABC of Vegetables and their Preparation in Spain, France, Italy, Greece, Turkey, the Middle East, and North Africa, with More than 200 Authentic Recipes for the Home Cook. (Boston: Harvard Common Press, 2001). pp. 300-301. ^ Rolland, Jacques; Sherma, Carol (2006). Spinach. The Food Encyclopedia: Over 8,000 Ingredients, Tools, Techniques and People. Toronto: Robert Rose. Archived from the original on July 24, 2011. Retrieved March 7, 2010. ^ Margaret Grieve; Maud Grieve (1 June 1971). A modern herbal: the medicinal, culinary, cosmetic and economic properties, cultivation and folk-lore of herbs, grasses, fungi, shrubs, & trees with all their modern scientific uses. Courier Dover Publications. pp. 761–. ISBN 978-0-486-22799-3. Retrieved 13 August 2010. Wikimedia Commons has media related to Spinacia oleracea. Chisholm, Hugh, ed. (1911). "Spinach" . Encyclopædia Britannica (11th ed.). Cambridge University Press.